As a truck driver, your primary goal is to deliver freight to shipping customers on time. Having to handle roadside repairs or operating a truck that is past its prime prevents you from reaching your goal. That’s why here at Simon’s Trucking in Iowa we offer onsite, in-house truck maintenance, as well as over the road maintenance services. Learn more about how we help our drivers focus on driving and what makes us Iowa’s top trucking company. Maintenance A occurs after every 20,000 miles and includes an oil change. Maintenance B occurs after 40,000 miles and includes both oil and tire changes. We utilize in-house diesel mechanics to ensure your tractor is the best of hands. Whether our drivers need emergency maintenance or scheduled preventative maintenance, we offer state-of-the-art diagnostics and services. Simon’s Trucking also has a body shop and paint shop to best serve the needs of our fleet of regional and over the road truck drivers. We provide maintenance on weekends when our drivers are enjoying some much-deserved home time. This means you aren’t taking time out of your working hours just to handle maintenance issues. In addition, our maintenance services are 100 percent free for our truck drivers. We allow you to come in for maintenance any time, whenever you need it. 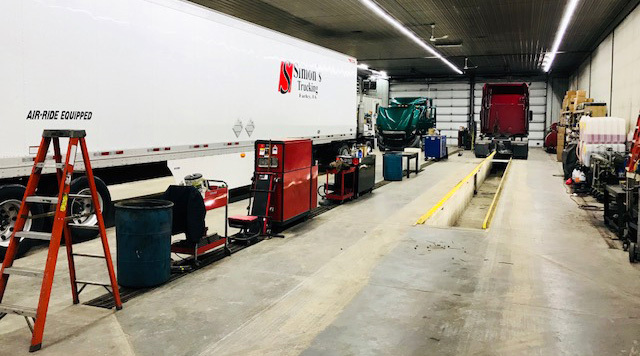 Our priority is to ensure your truck is operating at peak performance, and maintenance is necessary for that to happen. Maintenance services also ensure our drivers do not experience truck problems while on the road. Our fleet managers coordinate with the driver and a shop over the road. We take care of the payment, so our drivers don’t have to worry about spending their running money and dealing with reimbursements. Most trucking companies require their drivers to handle finding a shop and paying for services. In addition, they require drivers to get approval if they charge anything. This is a waste of time and prevents a driver from getting back on the road with their freight. That is the last thing we want to do here at Simon’s Trucking in Iowa, where we care about our drivers. If you want to drive for a trucking company that keeps your truck maintenance in mind, contact Simon’s Trucking to apply for a trucking job.